Merry Christmas from Japan! We hope that this letter finds you enjoying the hope and new life that was made manifest in the birth of our Savior. As we look forward to Christmas this year, we have an extra reason to celebrate. In our last newsletter we asked you to pray about the SIBC building situation as the church suddenly needed to find a new facility. Well, God has answered your prayers! 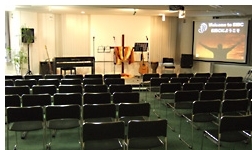 On November 26th we celebrated our first worship service in our new place. Praise the Lord! We are thankful to God for many reasons. First of all, we are thankful for God’s provision. After looking at many possible buildings, God finally lead us to a facility that is in an excellent location. 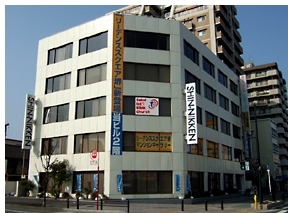 Located along one of the busiest streets in Sakai, SIBC is now very convenient and easy to find. The new church occupies half of the third floor in a five-storey building, and consists of a sanctuary, two classrooms and an office. Our sanctuary is slightly larger than before and the building has an elevator, both of which are a huge blessing. As for the rent, it nearly doubled from our old location, but this price is much better than anything else we saw. So, in many ways, this is a very good place for us, and we thank God for His wonderful provision. We are also thankful that the whole moving process went so quickly. From when we first found out that we need to move until the time we had our first service, it was less that three months. To be honest, this whole process really consumed a lot of time and energy, and often distracted us from doing the real work of the church. For this reason, we are grateful that everything happened in such a short period of time. So, now that the move is finished, we can once again focus on the real mission of SIBC. 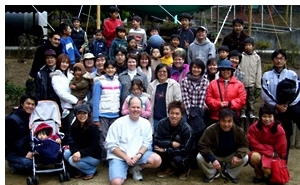 As a reminder, the mission of SIBC is to help both Japanese and non-Japanese (foreigners living in Japan) to become genuine lovers of God (Matt 22:37) and fully devoted followers of Jesus Christ (Matt 28:19-20). Finally, we are also thankful for the plan that God has for SIBC. As we mentioned in our last newsletter, this whole relocation process was not our idea. It was completely initiated by God. The Lord obviously has a plan and a purpose for us moving to our new location, and this is very exciting for the church. Although we do not know what this plan is (yet), we are certain that new blessings, new challenges and new opportunities to build the Kingdom of God are a part of our future. As a result, we have new resolve to walk by faith and fulfill the purpose that God has for the church. We are thankful for this. November 23rd was not only Thanksgiving Day in America, it was also a national holiday in Japan (Respect for the Aged Day). As a church, we took advantage of the holiday to have an outreach event at near-by Mt. Makio. 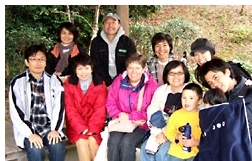 Despite the forecast for rain, we ventured out for a day of Japanese BBQ, fellowship, singing, testimony and hiking. Everyone enjoyed being outside for the day, and we only saw a couple of drops of rain. A number of non-churched people joined us on that day and heard a very clear testimony from Noji-san, one of our church leaders. If you would like to see a slideshow video of the event, please have a look at the “Media” portion of the Mason homepage. By the way, the top of the mountain boasts an awesome 300 foot roller slide! Luke ended up doing the slide 12 times, with each trip requiring a 5-minute hike back up the mountain to the starting point. He slept well that night! 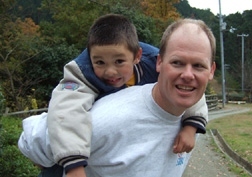 Finally, here are a couple of ways that you can be praying for us and the ministry of SIBC. 2) Please pray for the financial needs of the church. May God continue to provide for our needs, especially as we face the challenge of paying our increased rent. 3) Please pray for fresh vision for the New Year as we desire to walk out the plan and purpose that God has for the church. 4) Please pray for fruit from the outreach event. May all of the seeds that were planted in the hearts of unbelievers begin to grow. May the Lord lead many of them to attend church on Sunday. 5) Personally, please pray that God would refresh our Spirits. The whole moving situation took a toll on the two of us, emotionally, physically, and spiritually. Pray for a wonderful holiday season full of the joy, peace and blessing of our Lord Jesus Christ. As always, thank you for your many prayers of support. Your prayers are making a difference and are a testimony to that fact that we are all in this together. May you have a wonderful Christmas and a blessed 2007!